PEANUT, CASHEW, PECAN, macadamia, pistachio, salt. Africa - endless landscapes, boundless nature and untamed wilderness. As different as the landscape from the northern Arab to the southern cape, as varied are the nut sorts that are cultivated in Africa. A perfectly harmonious compilation of the best nuts in Africa can only be found again in our unique AFRICA DELUXE MIX. 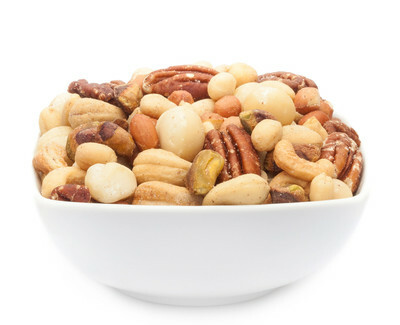 The crunchy peanuts, cashews and pecans are lined up to macadamias and pistachios. Refined with a slight salt pinch, you confer a pure taste experience without any additional spices. With every bite, the different aromas of the various nuts are genuine to enjoy. Send your thoughts on a heavenly journey through the wavering grass in the sun-drenched plains of the beautiful Africa.